The standings with one event to go. 121 runners completed the tough but enjoyable Deiniolen 10k on Wednesday 14th June as the locals turned out in their droves to cheer on the competitors in quite warm and dry conditions. The improving Gethin Jones (Cybi Striders) pulled away from Tom Roberts (Meirionydd) on the sting in the tail climb at 7.5k to win in a time of 34.23 with Tom clocking 35:08 followed by the first Eryri finisher Paul Wathan 35:43. Martin Green (NWRRC) took the MV/40 honours in 4th place overall in a time of 36:26 ahead of Eryri’s 6th placed Sam Orton 38:15. Noel Craine ran well to finish 13th overall and 1st MV/50 in a time of 40:38 while Iorweth Roberts won the MV/70 category with a time of 69:16. Pride of place goes to Jenny Charlton who pulled away from club colleague Elliw Haf to finish 25th overall and first female finisher in a time of 42:40 (Female, New Course Record?) with Elliw clocking 43:43. In all, at least 30 Eryri Harriers competed in the well organised event with special thanks going to Gwynfor James and his crew and the people of Deiniolen for being such welcoming and enthusiastic supporters of the event. Great race, brilliant conditions, records broken! Great weather for the majority of the day, brilliant marshalls and two fantastic routes, many thanks to the organisers! Starting in the long race at 9am from Aber, Matthew Fortes had another great run in a strong field and came in a brilliant 3rd overall! Andrea Rowlands had a fantastic run, was 1st overall lady also breaking the overall women’s record too! Jonathan Moore smashed his PB, Paul Jones was also quicker than last time and made up the 4-strong club 1st prize. Others from the Eryri contingent were Adrian Williams, Emlyn Owen (both having bashed their legs at various points! ), Elton Angle-Smith, Emlyn Roberts, Gwion Williams, Becki Law, Iwan Edgar (1st vet 60, the only one in the whole race, also breaking the record! ), Paul Hodges, Nia Albiston, Kate Worthington and Kean Rowlands – really well done everyone! In the short but still tough race, Martin Cliffe was a brilliant 2nd overall and 1st V40, 3rd was Russell Owen was also 1st V50, then Ed Harmer, Gary Porter-Jones, Jenny Heming (back from a snake bite!) was 1st lady, Emily Wood, Ali Thomas (1st V50 – record breaker number 3! ), Guto Edwards, Lou Emery, Mike Blake and Maggie Oliver (1st V60 and the only one in the whole race – another inspiration to us all, who ALSO broke the V60 record!). Sorry if I have missed mentioning anything/anyone! Cheers! 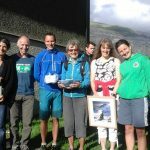 Some of the Eryri runners after the Welsh 1000m peaks race – a brilliant day out in the ‘homeland’! Credit to Awel (Jenny Heming) for the photo after the prize giving. The relatively small turnout for this new race, organised jointly by Eryri Harriers and Cybi Striders, didn’t stop us from having a fantastic day. The weather may have lowered the numbers but it certainly didn’t lower the mood of the 19 hard-core runners or the dedicated marshals and helpers. Heavy overnight rain meant the rocky course was mostly water-logged and very slippery in sections. This didn’t prevent the lead runners from setting a blistering pace out of the country park, along the coastal path and up into the rocks of the mountain. After a bit of jostling for position early on, the lead runners stayed close to eachother all the way round. Michael Corrales of North Wales Road Runners was the eventual winner, just pulling away from Gavin Roberts of Gog Tri to cross the finish line in a time of 53.16, with Gavin coming in less than 30 seconds later in 53.40. Third was Craig Jones of Eryri in 59.08, maintaining good current form to claim the V40 category too. Dylan Huws of Eryri took the V50 category finishing 9th overall in 1.04.39. First lady over the line was North Wales Road Runners’ Gemma Moore in 12th place in a time of 1.10.33. And Eryri stalwart, Ellie Salisbury, claimed the ladies V50 category in 1.24.20. A huge thank you to Wil Stewart of the Breakwater Country Park for his support, all the Cybi Striders gang for their invaluable help with the planning and organisation, and all the marshals for braving the elements. See you all next year.